Birthplace : Karnes County, Texas, U.S.
Goldie Hill, born Argolda Voncile Hill, was an American country music singer. She was one of the first women in country music, becoming one of the first women to reach the top of the country music charts with her number-one 1953 hit, "I Let the Stars Get In My Eyes". Along with Kitty Wells, she set the standard for future women in country music, such as Patsy Cline, Skeeter Davis, Loretta Lynn and Dolly Parton. 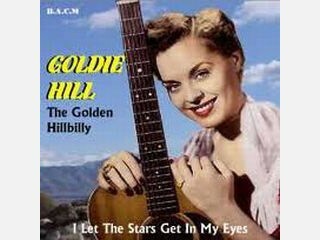 Goldie soaked up the popular country music of the era and developed a talent for singing. Early on, Goldie's older brothers Tommy and Ken left a life of cotton picking determined to make a name for themselves in country music. Within a few years, they were backing up Hank Williams, Johnny Horton, and Webb Pierce. Sister Goldie officially got her start on the Louisiana Hayride in 1953 as part of Tommy's band. Billed as "the Golden Hillbilly," she scored a number one hit in 1953 with her second single, "I Let the Stars Get in My Eyes," originally written by Tommy for Kitty Wells. Among her other charting tunes were several duets with either Ernest Tubb's son Justin Tubb or Red Sovine, including the big hit "Yankee Go Home." In 1957 she married country singer Carl Smith following his divorce from June Carter. In the late '60s she made a short-lived comeback as Goldie Hill Smith, without much fanfare. Following Carl Smith's retirement from music in the late '70s, he and Goldie lived on their horse farm outside of Franklin, TN, and the two began to show horses professionally during the course of the decade. View the full website biography of Goldie Hill.